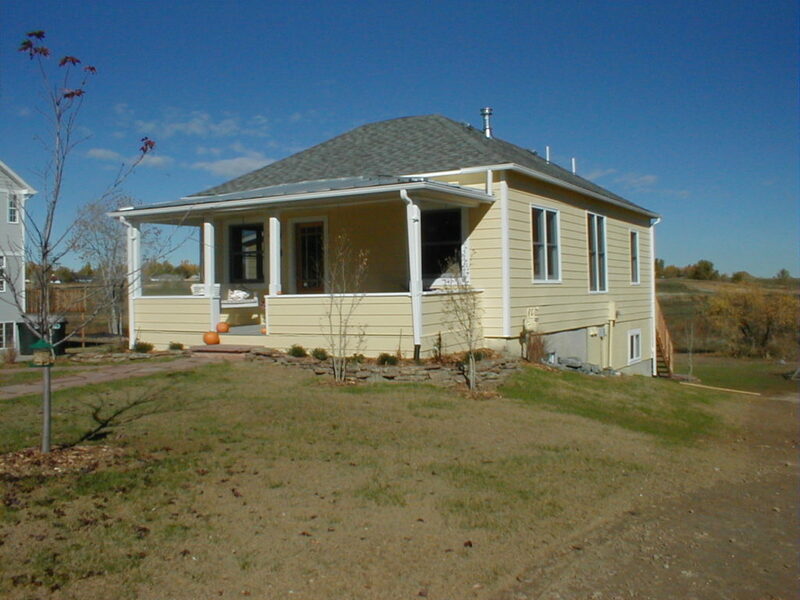 Cernich House – 6000 Bees LLC • Homesavers, preservation contractors, consultants • Lafayette, Colo. 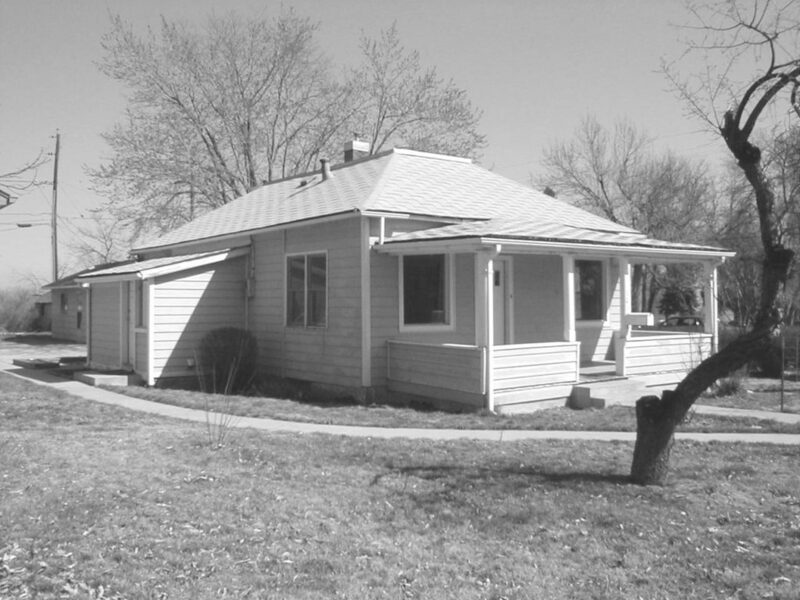 The Cernich House was originally located on the Cernich Farm at the northwest corner of 111th and Baseline Road. It was moved from the former Cernich Farm in 2000 to accommodate street widening. The original 900 sq. ft. home was built in the 1910s and was purchased in 1931 by coal miner Roman Cernich. Roman and Josephine Cernich raised 9 kids in the house and passed the house along to Frank and Helen Cernich in the 1960s. Moved to 509 E. Elm Street, the house is now 2,196 sq. ft. and was gut renovated by Doug Conarroe and a finished garden level basement was installed. Homeowners Todd and Jennifer Grant added 300 sq. ft. to the main level in 2010. “This white wood frame house had a pantry centered on the north wall (now the bathroom), which opened onto a small 6′ by 4′ hall with doorways leading to a bedroom on its east and one on its west side. This hall led into the kitchen which had a room to the east of it. This room was used as a bedroom for years until it was remodeled and most of the wall separating the rooms was removed and it became our daily eating area. A door opening was situated in the kitchen’s south wall where it abutted onto the west wall. This opening led into the ‘Sunday’ dining room. I still have fond memories of the large mahogany dining table filled with delectable food, around which sat an “orderly” mob of kids eager to do justice to mom’s tasty feasts. In later years, this table hosted the Peter, Smith and John Cernich families, though not all of them at one sitting. On the south wall of the dining room was the exterior door leading onto the front porch. Except for the coal burning kitchen stove, the only other heating unit in the house was the large coal burning heater in the main dining room. To facilitate the transfer of heat to the northern portion of the house, an 18″ by 18″ opening was cut into the dining room’s north wall near the ceiling and above the heater. After the coal furnace was installed in the basement, the heater was removed from the dining room and mom’s chiffonier was installed along its north wall. To the east of the dining room was the living room. The three foot passageway between the two rooms was enlarged to eight feet making more space available for company. At one point in time, a three foot door opening was cut into the north wall of the living room, which led into the kitchen dining room. This passageway was obliterated when the living room was remodeled by ‘Uncle’ John. In later years, a coal burning, stoker operated furnace was installed in the basement which heated the entire house with forced air. The furnace was fueled with crushed coal which was forced into its firebox by a metal auger. This large motor operated screw (six foot long) was attached to a metal coal bin having a l0 bucket storage capacity which had to be refilled daily. The main coal storage unit was an eight foot room located in the basement. It was filled with two or three truck loads of coal a winter. The truck backed up to the outside trap door on the north side of the house and dumped its load of dusty coal through the 4 foot by 4 foot trap door into the room below. Sanitation in the early days was slightly primitive. Everybody relied upon the two-holer outhouse (privy, latrine, toilet). The cold, windy, snowy weather made trips to that building an unpleasant experience, but we took them in stride and didn’t waste time pining for indoor plumbing because it just was not to be had. Waste water from the kitchen sink was piped into the cess-pool, a large covered pit, which I had to empty with a hand operated pump when it was filled with liquid. In the late thirties, Joe and Dad installed a septic tank (a sewage disposal unit) and the waste water from the house flowed into it, and was then piped 300 feet north where it emptied out onto the ten acres. Now it was possible to remodel the pantry and install a bath tub, wash basin and flush toilet. A few years after this installation, the family was dispersed because of World War II. One day, when she was feeling blue, mother cried a bit because the kids were not living at home now that the homestead was modernized. But the war came to an end and all the former small fries, now grown-up people, re-converged into the family palace. 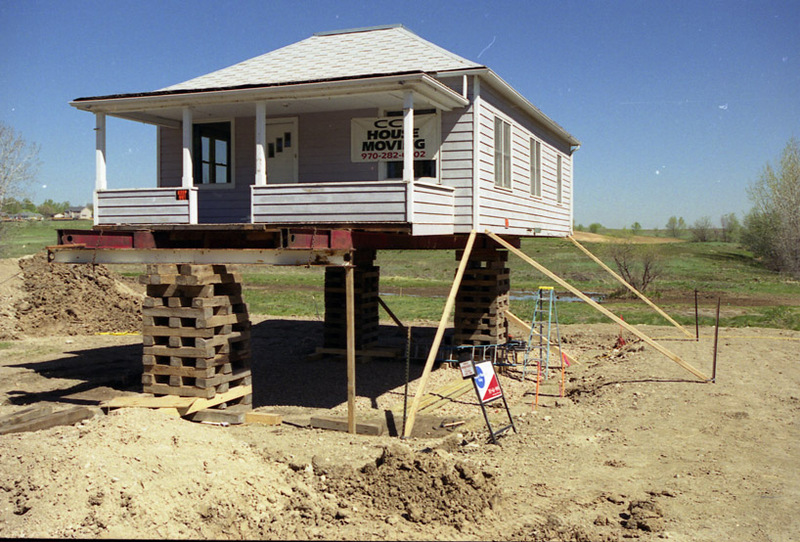 I do remember a few scenes of that sturdy old house. The tongue and grooved fir floor was only one layer thick with plenty of cracks in it. I remember seeing the linoleum in the center of the kitchen raise a foot above the floor by wind gusts which blew into the house through those cracks in the floor. Mary purchased oak flooring for the house from her meager earnings as a nurse, and a near by neighbor (a quarter mile north on the county road), Angelo Nuoci, nailed it onto the fir flooring. The Cernich House at 111th and Baseline. Cornish House at the location and awaiting concrete forms for the poured foundation. 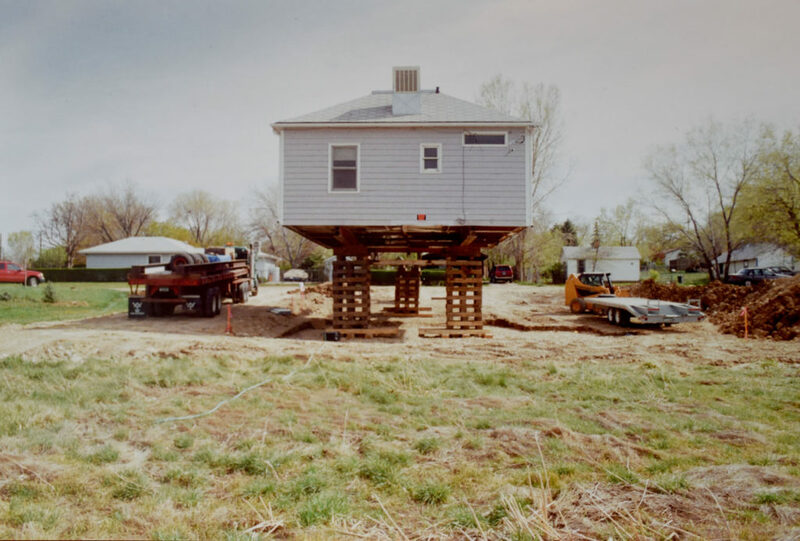 Rear view of the Cernich House up on cribbing after being moved from Baseline Road at 111th. 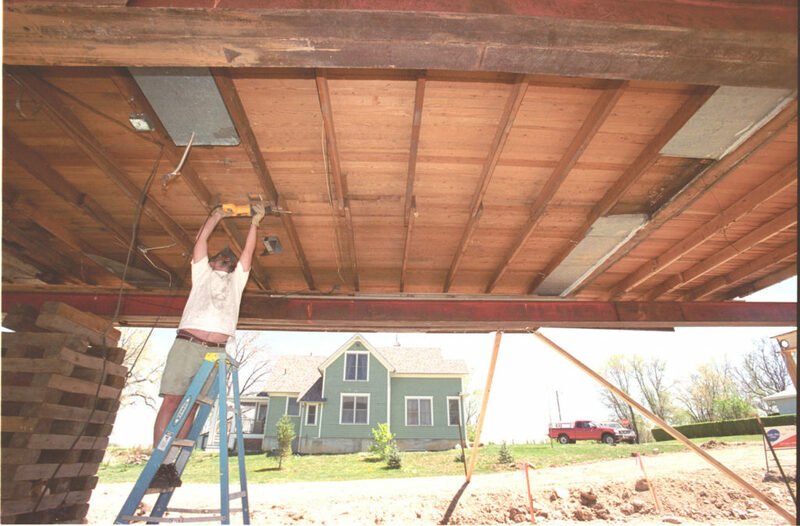 Doug Conarroe works on the underside of the Cernich House in 2002. Cernich House after renovation, taken in about 2004.